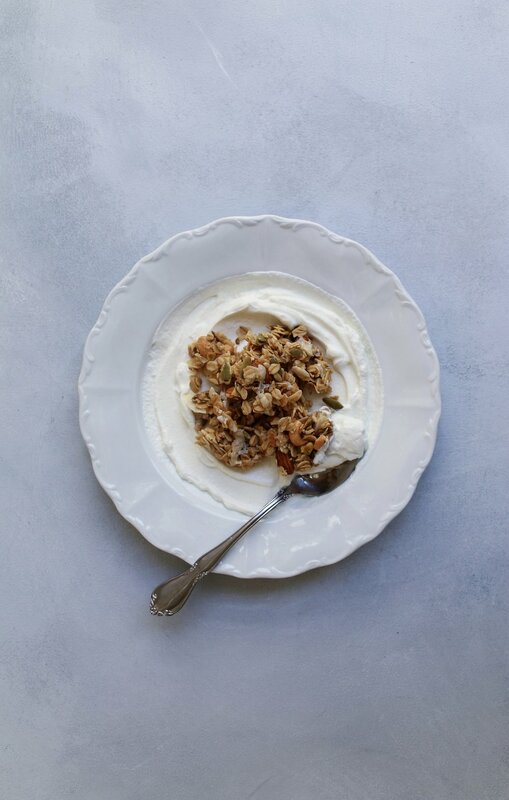 Lately, I've been making a big batch of granola every week or so as an easy and quick breakfast option, topping yogurt with a little drizzle of honey or fruit, and also as a snack mid-day when a little handful of something just a tad sweet with some crunch to it sounds nice. I've gotten my parents hooked on my recipe, so much so that I tend to do a little "granola delivery" and bring my father a jar full of just-toasted granola when I've made a fresh batch. 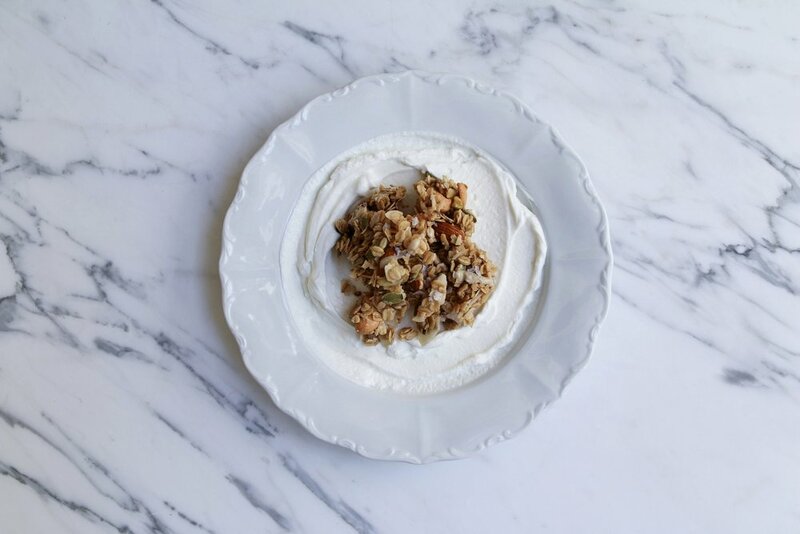 Tahini is an ingredient I've been experimenting with quite frequently and I figured I would give it a go in my granola; the result was a hint of nuttiness and a new yet vert subtle depth of flavor. If you haven't used tahini before, it's comparable to nut butter in consistency and it's made of ground sesame seeds. My suggestion when purchasing tahini is to find a brand that doesn't use much salt, or none at all, as too much salt can limit what you can use it for and impact the recipes you're using. 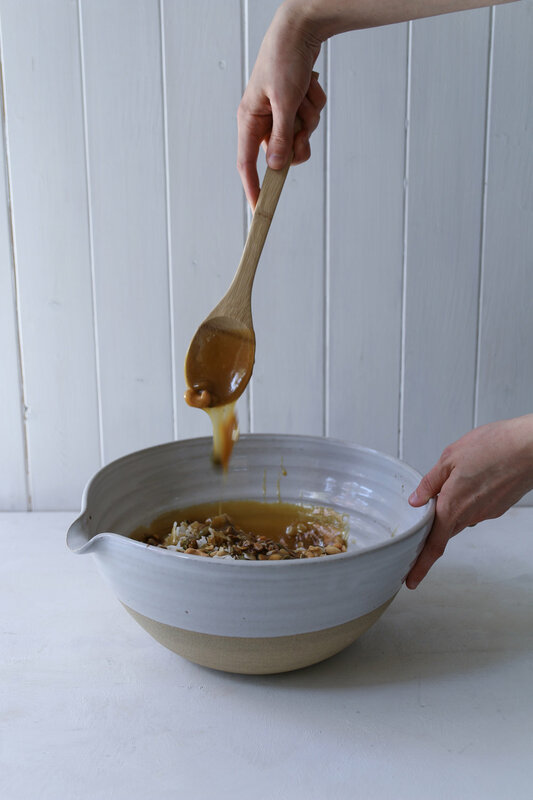 I use it fairly sparingly here, so as not to make it an overwhelming sort of addition, and I think it adds just the right sort of gentle, nutty taste. My method for making granola consists of heating the wet ingredients in a small saucepan over low heat until warmed to make sure all the ingredients are melted and thoroughly mixed. This keeps clumps of any one ingredient from appearing, resulting in a more uniformly tasting granola. The olive oil, honey, maple syrup, vanilla, and tahini will turn to a thick syrup when gently heated and whisked. Pour, toss around the dry ingredients, and it's ready to be toasted. Using parchment paper, one of my favorite basic kitchen tools, is encouraged. It will keep the granola from sticking to the pan and make for an easy clean-up! When the granola has finished toasting in the warm oven, drizzle with a spoonful or two of tahini as it cools. It will stay fresh the longest in an airtight container that's tucked away in a cool refrigerator. In a large bowl, combine oats, coconut flakes, nuts, and seeds. Set aside. In a small saucepan over low heat, combine the olive oil, maple syrup, honey, tahini, and vanilla. Whisk until combined, warm and fragrant, and pour into the bowl of dry ingredients. Toss together with a spoon, adding the salt to taste (up to 1/2 teaspoon), until combined. 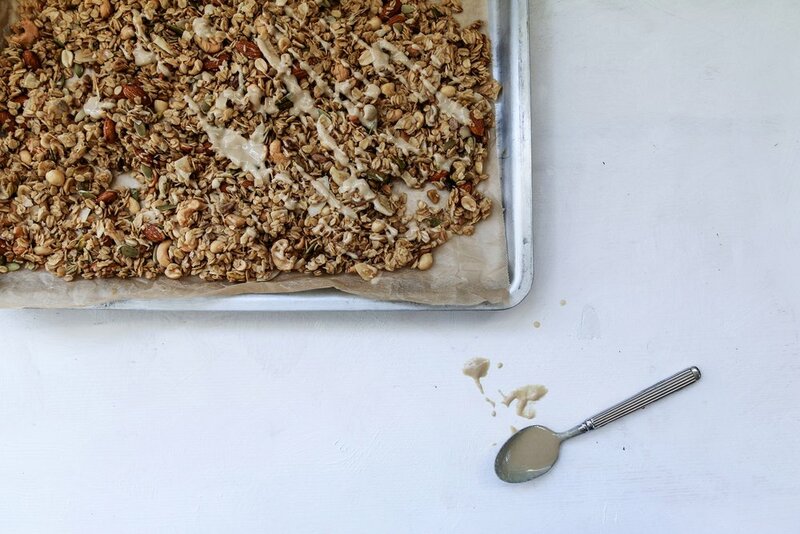 Line two baking sheets with parchment paper, then spoon half of the granola onto each pan, spreading evenly. Pop the granola into the warm oven and bake for 20 minutes, then after stirring each pan a bit, bake for another 20 minutes. Remove from the oven, and allow to cool completely without stirring, as this will allow the granola to keep in clumps, if you like your granola that way. Store in an airtight container in the refrigerator.